Unlike four-wheel vehicles, given the physical characteristics of a motorcycle, there are more inherent dangerous variables involved in riding a motorcycle. Its two-wheel design makes riding a motorcycle less stable when driving under bad weather conditions, swerving in between traffic to pass up another vehicle, coming up on road debris, or suddenly breaking to prevent a collision. Its compact size makes motorcycles less visible to other drivers on the road if a driver is distracted, under the influence, or simply fails to see a motorcycle driving in a blind spot, leaving motorcycle riders vulnerable to others’ negligent driving. Its light weight design allows motorcycle riders to drive at very fast speeds but leaves them physically exposed to suffer the most damage when a collision with another vehicle occurs. Compared to other vehicles on the road, motorcycles generally do not come equipped with airbags or have seat belts attached, therefore motorcycle riders are at a complete disadvantage in a collision because of the inherent lack of protection that exists between them and the road. As a result, most motorcycle accidents cause serious physical injuries beyond mere bruises, scrapes and mild concussions. A motorcycle accident victim is likely to suffer grave injuries from broken bones that may lead to amputations, to spine injuries resulting in paralysis, to brain injuries and wrongful death. Given the critical injuries unique to motorcycle riders and the complex nature of motorcycle collisions, you need an experienced personal injury attorney who specializes in motorcycle accidents. At the San Diego Injury Law Office, we understand first-hand the perils of driving a motorcycle when another driver on the road fails to exercise reasonable care causing an accident that damages your motorcycle and results in devastating injuries to you. Our experts use their extensive knowledge of the specific personal injury laws that govern compensation for motorcycle accident claims to fight insurance companies so that our motorcycle accident victims never have to pay for the negligence of other drivers. If you or a loved one has been a victim of a motorcycle accident give us a call today at (619) 343-2992, we are here to provide you protection under California tort law by explaining your rights to recovery and helping you file a claim to obtain the just compensation you deserve! The primary cause of motorcycle accidents is loss of stability, high risk conduct and failure to comply with traffic laws. All of these risks increase in the state of California due to the fact that no law exists prohibiting motorcycles from sharing lanes with other vehicles. The only guideline set forth by the California Highway Patrol is that splitting lanes is allowed on a motorcycle when done in a safe and prudent manner. The problem with motorcycles driving in between other vehicles of stopped traffic on the same lanes is that even in slow moving lanes, given a bike’s size, weight, and speed, the motorcycle rider may be unable to respond to other’s driver’s sudden maneuvers resulting in a collision. To protect its motorcycle riders from deadly collisions, the California state legislation has mandated that all riders and passengers on a motorcycle must wear a U.S. DOT compliant safety helmet. This is a safety helmet that has been certified by its manufacturer to be in compliance with the U.S. government’s requirement of thick liners for size and protective padding for strength to protect the motorcycle rider from head injuries in the event of a collision. To protect accident victims after a motorcycle accident, the California Vehicle Code requires motorcycle drivers to maintain a minimum insurance coverage of $5,000 for property damage, $15,000 for a single injury, and $30,000 for multiple injuries in a single collision. The California Department of Motor Vehicles also requires any motorcycle driver involved in an accident to report the collision to the DMV field office or California Highway Patrol within ten days of the accident. Regardless of who is at fault in the accident, it is important that you understand that your failure to report the accident may result in your driver’s license getting suspended. It is important that you report the collision in person at any DMV or CHP office or online at www.dmv.ca.gov. After reporting the collision to DMV or CHP, the most important thing for you to do next is to make sure that you get the best legal representation available because nothing will impact the resolution of your claim more than the reputation of the personal injury firm that handles your claim. At the San Diego Injury Law Office, we have vast experience serving the San Diego motorcycle community, handling motorcycle victim’s personal injury cases from the initial stages of filing the claim all the way to reaching a successful settlement stage. For the best legal representation after a motorcycle accident, give us a call today at (619) 343-2992, our knowledgeable personal injury attorneys are standing by to provide you with a free consultation to review the merits of your claim! At the San Diego Injury Law Office, we realize that no one is ever mentally, physically, emotionally, or financially prepared to handle a personal injury claim after surviving a motorcycle accident. That is why we offer the best legal team of personal injury experts on a contingent fee basis so that you may receive the representation that you deserve without having to worry about paying for any legal fees out of pocket. Our primary goal is to make sure that you are made whole and only if we achieve this goal will we get paid for our legal services after you are compensated. The first step towards obtaining a just compensation is to build a strong personal injury claim. We begin this process by having our legal analysts research the different insurance policies for all the drivers involved in the claim and have our private investigators conduct a thorough investigation of the accident to determine liability. Next our skilled personal injury attorneys will meet with you to prepare the personal statement of the accident that you will have to provide to the insurance adjuster assigned to your claim. To support your statement, we will have to gather all of the necessary documentation of the collision as evidence to prove the harm that you suffered. Our legal analysts will work with you to obtain the other driver’s contact information, driver’s license number, insurance policy, and the license plate number for the vehicles involved in the collision. You also want to make sure that you provide pictures of the scene of the accident, depicting the time, weather conditions, road conditions, vehicles involved in the accident and vehicle positions immediately after the collision. It is also recommended that you take pictures of any damage to your motorcycle, to the other vehicles and any injuries that you may have sustained as a result of the collision. However, our experience handling motorcycle accident cases has taught us that sometimes the injuries our victims suffer make it impossible for them to collect all of this information. Please note that your safety is our number one priority, if you are injured after the collision we do not want you to delay seeking medical attention to obtain documentation for your claim, we want you to immediately go with the first responders at the scene. Our team of legal experts includes private investigators who are at your disposal to go back and visit the scene of the accident to take all the necessary pictures, go to the impound or repair shop to inspect the damage to your motorcycle, interview any witnesses that can attest to the events that led to the collision, obtain a copy of the accident report from DMV and visit you at the hospital to take pictures of your injuries. In the event that you do not feel that your injuries require aid from the first responders, we still strongly encourage you to receive medical attention as soon as possible after the accident to determine the severity of your injuries and ensure that the right course of treatment is provided. Even if you feel that the collision was not severe enough to cause any serious injuries, it is important that you seek a medical check-up after a motorcycle accident to rule out any possibility of delayed effects from injuries that cannot be seen. A lot of times, motorcycle accident victims shy away from seeking medical attention for their injuries because they do not have health insurance and cannot afford medical treatment. At the San Diego Injury Law Office, we do not want your financial situation to deter you from seeking the medical assistance that your injuries require, that is why we count on a network of medical providers who work specifically with motorcycle accident victims on a contingent fee basis so that you can receive the treatment you need without having to pay any medical bills upfront. However, it is crucial that you keep all medical records of any diagnosis, treatment, medication, therapy, prognosis, and bills that you receive so that we may take these into account when determining the extent of the harm that you suffered in our demands. By providing our legal analysts with all this valuable information, our skilled personal injury attorneys will be able to assess your case, recommend the best course of action for recovery and begin negotiating your claim with the opposing insurance company on your behalf. If you or a loved one has been involved in a motorcycle accident the first thing you need to know is that while the road to recovery may be a long one, you do not have to face it alone. The reality is that motorcycle accidents can be financially devastating for the victims and their loved ones. In most collisions the physical damage to your motorcycle will require extensive and costly repairs if it can be repaired at all. In a few cases the damage to the motorcycle is irreparable and you will have to wait for your claim to be settled before you are able to even think about replacing it. In the meantime, you will be left without a vehicle and forced to look for an alternative mode of transportation to get to and from work. This is a good case scenario. Oftentimes going back to work after a motorcycle accident is not even an option because of the severity of the injuries from the collision. Whether you have been hospitalized, undergoing surgery, temporarily disabled, sent home on bed rest, or receiving physical therapy, your rehabilitation will cause you to miss time from work. This becomes a tremendous burden not just for the accident victims but also for those who depend on them, as the inconveniences, loss of wages, and added expenses from the accident drive the entire family into despair. But you have to be very careful not to allow your despair to interfere with the negotiation of your claim. Insurance adjusters know that you are desperate to settle and will take full advantage of your predicament during negotiations to try to settle the claim for much less than it is actually worth. The best way to protect yourself from becoming easy prey for opposing insurance companies is to retain a skilled personal injury attorney who has vast experience handling claim adjusters, successfully proving pain and suffering to obtain just compensation for the victims of motorcycle accidents. At the San Diego Injury Law Office, our reputable personal injury firm specializes in motorcycle accident cases; our experience with these cases allows us to quickly determine how much your claim is worth and our evidentiary knowledge will help us to demand and successfully prove up your damages. Damages are the financial compensation that you are entitled to receive from the person responsible for causing the collision as the victim of a motorcycle accident. Damages in motorcycle accident cases include the costs of repairing or replacing your motorcycle, the present and future medical expenses that you will incur to treat any injuries that you received from the accident, the loss in wages that you suffered for having to miss time at work, any loss in your future earning capacity as a result of a temporary or permanent disability, as well as the economic value that we will assign to the pain and inconvenience you have suffered as a result of the motorcycle accident. Our skilled personal injury attorneys will thoroughly negotiate all of your medical liens, recovery expenses, wage losses, repair estimates, car rental agreements, and any billing statements associated with the accident to make sure you recover the full extent of the harm you suffered from the collision. You can be certain that during negotiations we will communicate with you any offer that we receive along the way and fight until all of our demands for compensation are met. Remember do not sign away your damages, first contact a reputable personal injury law firm you can trust to review any settlement offer you receive from the opposing insurance company. When it comes to reaching a settlement for motorcycle accident victims, with the San Diego Injury Law Office in your corner, you can be sure that we will not leave any money on the table and will fight for every dollar you deserve! 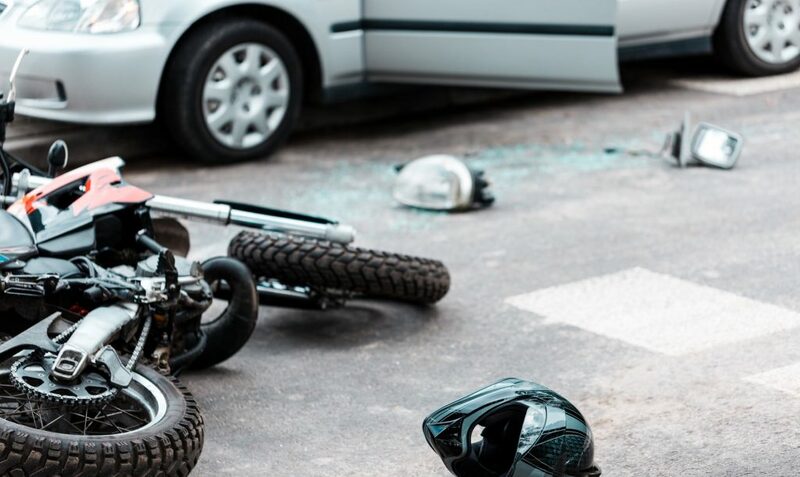 If you are a motorcycle driver who has been injured or your property has been damaged as a result of another person’s negligent driving, you have a legal right under tort law to recover damages for the harm that you suffered from the accident. However, it is important that you understand that your right to file a lawsuit to recover from the opposing insurance company is not an unlimited right but one that must be exercised within the time restraints established by the statute of limitations. A statute of limitations is the specified maximum amount of time that the law permits a plaintiff in a civil tort claim to bring a lawsuit. In California, the statute of limitations sets forth two different timeline requirements depending on the nature of the damages sought by the motorcycle accident victims. A motorcycle accident victim seeking property damages, like the cost of repair or replacement of private property, has three years from the date of the accident to pursue legal action. Whereas, a motorcycle accident victim seeking to file a lawsuit for personal injury damages has two years from the date that the injury was discovered or could have been discovered. This is an important distinction from the date that the clock begins to run for property damages because unlike property damages which can be readily ascertained at the scene of the accident on the day of the collision, the nature and extent of motorcycle accident victim’s injuries cannot. Given the unique nature of the injuries caused by motorcycle accidents, it is not uncommon for some injuries to delay in manifesting themselves or for it to take some time for doctors to fully diagnose the extent of the injuries you have suffered. That is why it is crucial for you to protect your right to recover damages by ensuring that you get a medical check-up immediately after a motorcycle accident to determine any injuries that you may have received from the collision. Otherwise, not knowing that you were injured because you failed to receive a medical check-up will not exempt you from the two-year time allotted under the statute of limitations and your claim will be barred. Do not allow this to happen to you, protect your right to recover damages in a personal injury claim by retaining a knowledgeable motorcycle accident firm that you can trust to quickly assess both the full value of the damages in your claim and the legal time frame available for recovery in your case. At the San Diego Injury Law Office our experienced personal injury attorneys understand very well what it is that you lost the day of the accident, your health, your piece of mind, and the ability to provide for your loved ones. We are here to make sure that all of your pain and suffering is accounted for and that you exercise your right to recovery well within the time allotted under the statute of limitations. The only way to accomplish this is to for you to act quickly, so please pick up the phone and give us a call now at (619) 343-2992 so that we may establish the date of expiration on your personal injury claim and begin working efficiently to obtain the just compensation that you deserve, before it is too late!